If Spicy is not your thing…you will love this Delightful Hummus recipe that works with the subtle sweet flavors of roasted Bell Pepper! Soak 1/2 cup chickpeas overnight. Next day pressure cook with salt until soft. Charr & blacken 1 big red bell pepper and 2-3 garlic cloves over open flame/grill. Wrap in foil and keep aside for 5 minutes. Open and rub with foil to peel the garlic & roasted red bell pepper. Grind the fork tender chickpeas with 2 tbsp tahini, the roasted garlic & the roasted red bell pepper. Adjust salt to taste. Pour out onto serving dish, make grooves with a fork, top with some olive oil. 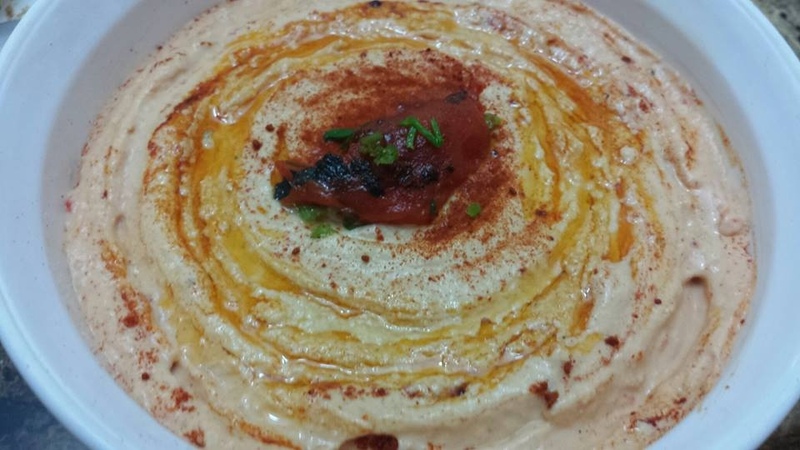 Sprinkle with some smoked paprika…serve with warm pita! PS: I chose to keep spices to the minimum to highlight the flavor of the sweet bell pepper! Dahi Chawal …..made in a clay pot!